“If you look at the size of many diving knives you might be led to believe that they are primarily weapons. This is not the case, a diving knife is a tool used for picking, digging, and measuring. You face a minimal risk of entanglement underwater, so it is also useful for cutting yourself loose from fishing nets or line, and seaweed or kelp. For this reason, it is important to ensure the knife remains sharp and that it has a serrated edge since this is actually more useful underwater. 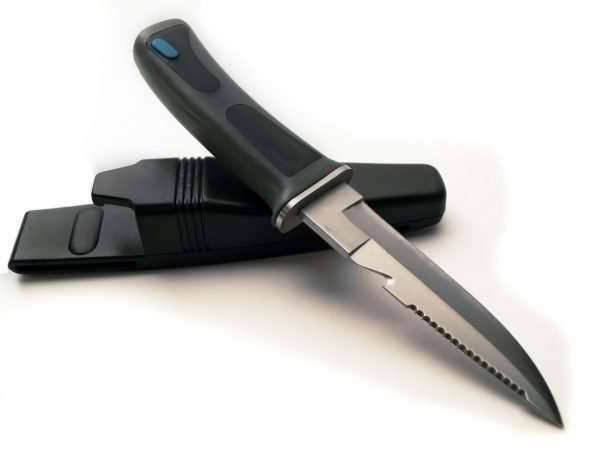 Dive knives should be made of stainless steel but this is a problem since the choice of steel alloy is a compromise between the degree of stainlessness and sharpness. It is important that you take care of your knife so it will not corrode. Regular cleaning, oiling and sharpening are key, but check what the manufacturer recommends. Some knives are made of titanium, which is as hard as steel, but does not corrode and is significantly lighter (and more expensive). There are many ways to fasten a dive knife to your kit, but — just as for the weight belt — it is important that you can reach it with one hand. The classic position is strapped inside the lower leg, reducing the risk of entanglement. However, as this is further away from the hands many consider that inside the triangle attached to the BCD is a better place (see Chapter 4 of Diving Equipment). Large knives are becoming rare for general diving — small knives incorporating line cutters are just as useful and easier to attach to the BCD.